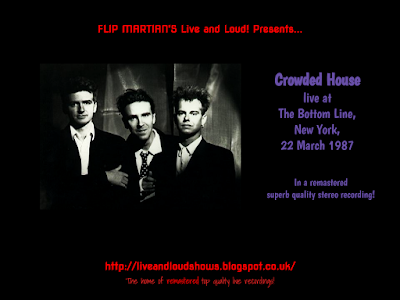 A second gig from Crowded House for Live and Loud! - and this one is from much earlier in their careers. After forming in 1985 when Split Enz came to an end, they eventually moved to the USA to record their first album - Crowded House - which was released in June 1986. Don’t Dream Its Over became a huge hit later that year and broke the band around the world. They went back to the USA at the start of February 1987 and started 4 solid months of touring the country. This show is from that tour and was the first of 2 nights at The Bottom Line; this show originally broadcast on FM radio there. The recording was in fairly good condition, just a bit flat sounding. 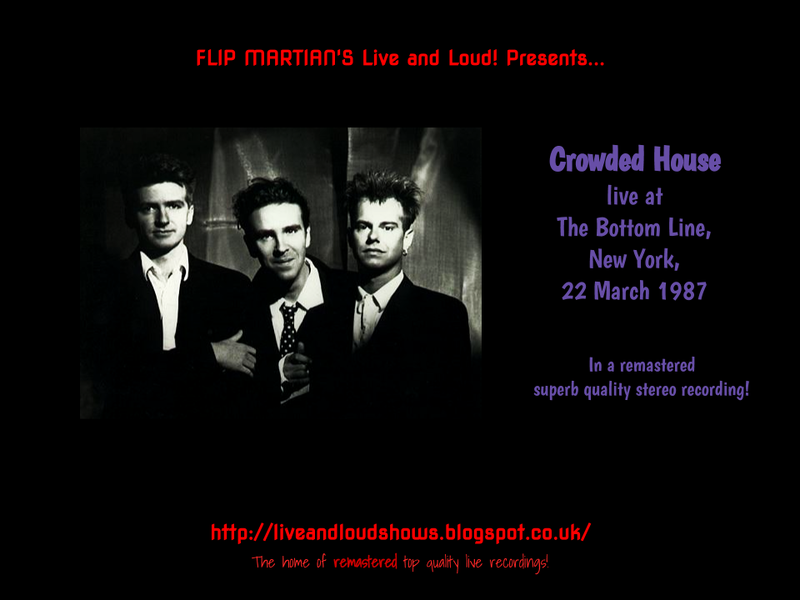 Someone had faded out the end of every track on this recording before I got it, so there's not QUITE so much banter from the band in between songs as on the other show I did last year (you can find the other 2 Crowded House shows here) but its still a great show. I repaired some of those fades where they were quite severe and with some EQ to separate out and enhance the instruments and remove some of the sibilance from Neil's vocals, the show has polished up pretty well and sounds very clear. Great share Flip, thanks for all your hard work, much appreciated. Really looking forward to this one. Thanks! Thanks a million for this! Had it on a bootleg tape in the early ninties, have been looking for it online on and off for 20 years!!!! Hopefully this will sound just that bit better than an old tape too. Enjoy!